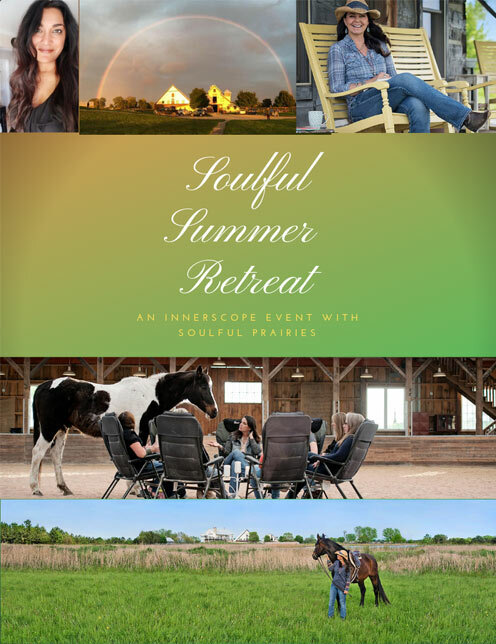 Anita Myers of InnerScope Consulting joins with Linda Bruce of Soulful Prairies to present you our annual Soulful Summer Retreat! As a woman-centered event, partake in a true Maiden Voyage of the “S.S.Retreat.” As you enter, you’ll unplug from the old and experience a breath-giving, life-loving journey designed to regenerate not only your core and heart, but also your brilliant, amazingly magical mind. The sounds and scenery found within the gorgeous landscape of the retreat will nudge your soul to rediscover the beauty of life’s simple pleasures. The four story, barn-style home provides a shabby chic style accommodation that invites you to enjoy its comfort, security and openness to free yourself from the daily grind that occupies your mental and emotional real estate. And there is no iceberg to worry about hitting! At the S.S. Retreat, you can truly open your arms wide and feel like you’re flying like you're "Queen" of the world! Between your scheduled experiences the S.S. Retreat welcomes you to enjoy serenity by resting in calming rocking chairs positioned within its wrap-around porch that overlooks the relaxing countryside. You’ll depart from the wholesome lifestyle recognizing a fresh, beautiful, more powerful you. MIND – While the countryside atmosphere seduces your mind to snuggle with the comfort of nature and its cozy environment at the S.S. Retreat, prepare your mind to travel through adventures, relax within the security of the space you’re worthy of having, and strengthen through the flex and release of the challenges and victories within you. We’ll discover, explore, navigate, and grow mentally and emotionally. Experts in these areas will emerge to share tips and important information to help detox, blueprint and build your mental design that will help reinforce your personal powers of awareness, communication, and writing. BODY – Life on Earth begins with our very first breath, followed by nourishment, activities, then sleep. The first breath ignites a slew of changes that allow for the rest of the body to function in the way its intended. Look forward to reuniting with the benefits of proper breathing to help heal our body from the inside out and bring new life back to the flow of life within ourselves. Nourishment is provided in the Soulful Prairie’s kitchen where the definition of healthy food being unappealing is disproved. You’ll enjoy fresh made organic-focused foods, and dedicate the needed time to appreciate the incredibly powerful design of your body. And with activities designed to strengthen and relax, followed by a restful night’s sleep, the retreat intends to reignite your physical presence. It is truly a present worth having. SPIRIT – Energy is one of the greatest, gifts we’ve been given, housed as a soul within us. It is, in it’s true form, the place where our power resides. The conductor of our every move. Every neurological impulse, conscious action and reaction is completely dependent upon the collective electrical impulses that’s 100% charged by our glorious power. Identifying it, working with it, owning it. And recognizing it among the living around us will bring our spirit to a new awareness of life as we need to know it. Soulful Summer Retreat’s expert Linda Bruce will be guiding you through a powerful energy experience with her horses, bringing spirits together that will illuminate areas within you that need it most. The S.S. Retreat brings you a series of empowering wellness experiences with selected experts, an afternoon luncheon with a trailblazing wellness and holistic chef, and all of the luxury and rustic adventure needed, and designed for you. We look forward to a wonderful weekend with you! You have two options for the Soulful Summer Retreat. You will be able to select the option you prefer, and if you want to add the Sweat Lodge experience, on the registration form. Participants find the sweat wholly uplifting and rejuvenating. No matter what spiritual path you are on, the lodge is a beautiful experience. Whether you prefer to meditate in the heat and steam or dig deeper by connecting with your true self or higher power, the lodge is a powerful tool. Read more about the Sweat Lodge. A 75% refund of the total retreat fee will be returned if you cancel two weeks or more prior to the event. If an emergency situation arises please contact us and we will be happy to work with you. If you find that registration for the Soulful Summer Retreat has closed, please signup for our waiting list. If their is a cancellation, we will contact you. Thank you! Arrive Friday July 19th at 7 pm and depart Saturday, July 20th at 4 pm. Arrive Saturday July 20th at 8:30 am and depart later that day at 4 pm.